If you have priced a Disney World vacation lately you may have noticed that it can be one of the most expensive family trips you can take. So when faced with the choice of adding on an extra expense, like Mickey’s Not-So-Scary Halloween Party, it is important to weight the pros and cons to make your final decision. What Is Mickey’s Not-So-Scary Halloween Party? Beginning in mid-August and running through select nights through Halloween, you will find something called Mickey’s Not-So-Scary Halloween Party (MNSSHP) at Magic Kingdom. This event is billed as a way to experience the Magic Kingdom with smaller crowds and some unique experiences in exchange for the purchase of an extra ticket. The party officially runs from 7pm until midnight, but party ticket holders may enter the Magic Kingdom beginning at 4pm on their party night. There is also Mickey’s Very Merry Christmas Party which starts right after Halloween. Here is more information on the Christmas party in case your trip overlaps the seasons. Ticket sales are capped, so theoretically there should be lower crowds in attendance. This may be more beneficial for those attending parties toward the end of the summer crowds or closer to Halloween. Not all attractions run on party nights. Check here to see which attractions will be running for the party. Generally the ones that do run have shorter wait times than usual. This is especially true during parade/fireworks and as some visitors tire out and leave the park for the night. Who doesn’t love a good character interaction?! 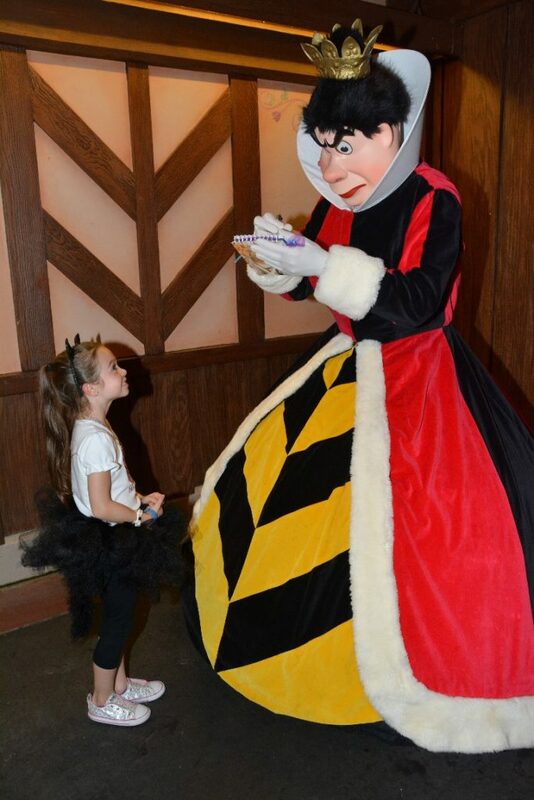 During the MNSSHP is a rare opportunity to meet villains. For example, in the last few years we have met Cruella de Vil, the Queen of Hearts, Jafar, and Lotso. If villains aren’t your thing Jack and Sally (from The Nightmare Before Christmas), Moana, princesses, traditional characters in Halloween costumes, and the Seven Dwarfs are also available on MNSSHP nights. Please note since these are special character experiences the lines can get VERY long with wait times of 90 minutes or more. Available characters are not guaranteed and can change without notice. The Boo-To-You Halloween Parade starts with the headless horseman galloping down the road and is followed by a not too scary cast of characters to celebrate the season. There are two Boo-To-You Parade times per night, an earlier parade before fireworks and a later one after the fireworks. Plan to secure a viewing spot an hour or more before showtime if a castle view spot is important to you. The Hocus Pocus Villain Spelltacular is a show on the castle stage that features the Sanderson sisters from Hocus Pocus. The sisters are brewing up a Halloween potion and invite some favorite villains like Dr. Facilier and Oogie Boogie for a fun Halloween party. We set up our blanket at our preferred parade spot and my mom waited while we watched the show last year. This year we waited and got a spot closer to the stage. The Hocus Pocus Villain Spelltacular is really good! Happy HalloWishes is the special fireworks spectacular with just a hint of spookiness for Halloween. We love Disney World fireworks! 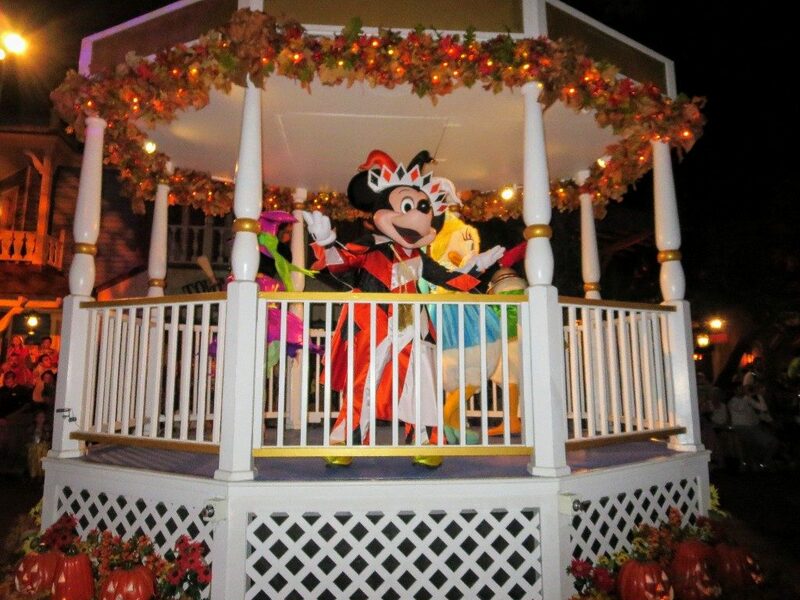 Many people love the trick-or-treating option during Mickey’s Not-So-Scary Halloween party. There are designated trick-or-treat locations throughout the park where cast members distribute candy. People I know have gotten gobs of treats at MNSSHP. Unfortunately, because of my daughter’s food allergy we had not been able to participate in the trick-or-treating in previous years. 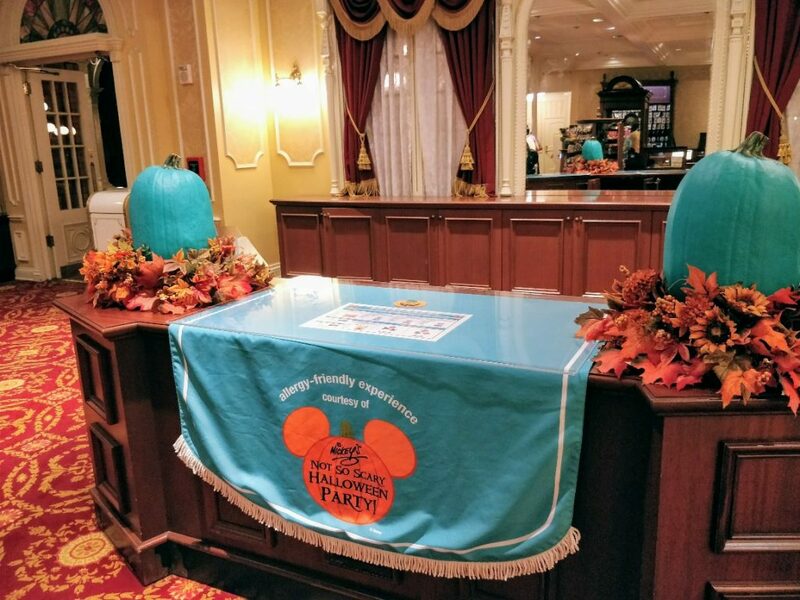 However, starting in 2017 Mickey’s Not-So-Scary Halloween Party added Teal Pumpkin options for allergy-friendly trick-or-treating. A teal pumpkin indicates that allergy friendly treats are available for those trick-or-treating with food allergies. 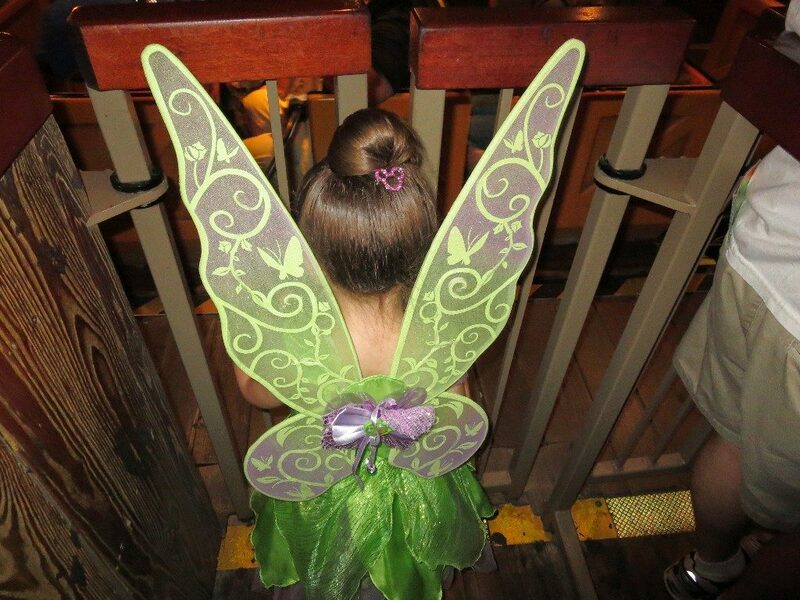 Find out more about dealing with food allergies at Disney World here. How does the allergy-friendly trick-or-treating work? Request a teal pumpkin trick-or-treat bag when you get your party wristband . Trick-or-treat at any of the designated spots at the party. Instead of getting candy you will be provided a teal token. Once you are done trick-or-treating you take these tokens to either the Town Square Theater or Liberty Square Ticket Office. Trade in your teal tokens for allergy-friendly treats of your choice. There were several varieties of allergy-friendly Surf Sweets, YumEarth, and Enjoy Life cookies or candies. You can also choose to use your tokens for non-food items like small Halloween trinkets. Enjoy Life, YumEarth, and Surf Sweets are some of our favorite allergy-friendly treats at home. Elizabeth was so excited to have safe candy to snack on like other kids at the party. I love that now kids with food allergies have the chance to participate in the MNSSHP trick-or-treating fun. General park rules at Disney World do not allow those over age 13 to wear costumes to the parks. The MNSSHP is a rare exception where all ages may wear a costume at Magic Kingdom. Keep your eyes open for some excellent themed family costumes! Also make sure you review the official Disney World special event costume policy before you go. We have personally opted to do the MNSSHP each time we have been in town on a party night, even though we have rarely made it until close. Meeting unique characters, the special parade and fireworks, in addition to shorter attraction wait times have been enough to justify the cost for us. The answer really depends on your group. Those with small children who are not night owls might not get the most out of these pricey tickets. The party tickets often run just below the cost of a one-day regular park ticket. 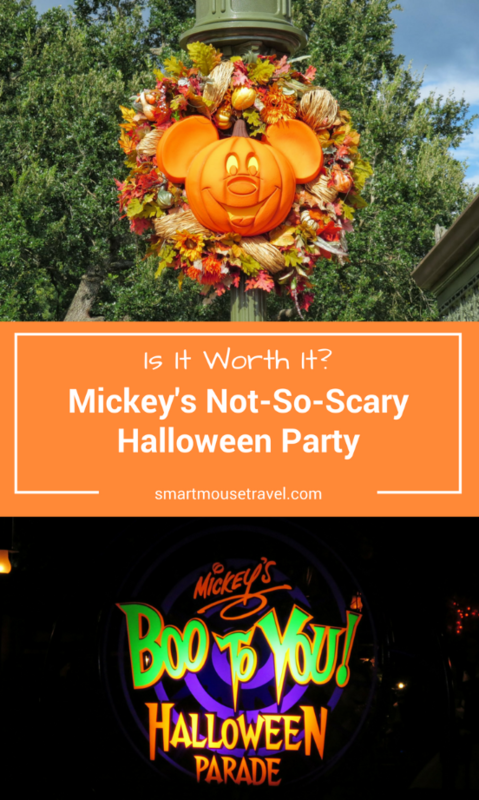 If you have smaller kids or are bummed that not all of the attractions are open during the party I would recommend skipping Mickey’s Not-So-Scary Halloween Party. Often you can get more park time for your family by adding on an additional day to a multi-day ticket (instead of that pool day you were considering) than by buying the party ticket. If you decide the party is right for you, here is where you can buy tickets online. One final word of warning. Mickey’s Not-So-Scary Halloween Party has so many entertainment options that it is nearly impossible to do them all in one night. Have you done the Mickey’s Not-So-Scary Halloween Party? What was your favorite thing about the event? Did you think it was worth the additional cost? It looks fun. I still have never gone. We are pass holders and always feel were good with the normal Halloween events at the park to not pay for the party, but it looks like I will have to give it a try. Do you have to leave the park when the Halloween party starts if you just have a regular ticket for that day? If you have a regular ticket for Magic Kingdom on a party night the park closes to you at 6pm. You don’t have to exit the park immediately, but last year they did not allow you to enter lines for rides after 6pm without a party wristband. If you would like to stay at Magic Kingdom after 6pm you would need to buy the MNSSHP ticket in addition to the day time ticket. If you are only attending the MNSSHP, do you still have to purchase a base ticket on top of the MNSSHP? Is MNSSHP worth the money to take an 18 month old? The honest answer is it depends on your family. Kids younger than 3 years old don’t need a ticket which does help lower the cost. If it were me, I would go only if I knew my child would be able to comfortably stay at the park until at least 9pm. And I would take it easy earlier in the day to avoid toddler burnout from going non-stop all day.